scientists have found a new use for mobile phones that could help provide healthcare to people in remote areas who have no access to doctors or hospitals. 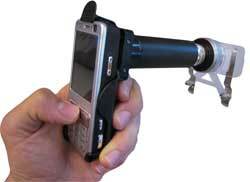 They have created the CellScope--a mobile phone fitted with a microscope and a built in image analyser. It can be used to field test blood and sputum samples; the magnified images with the parasite count can be sent to doctors in any part of the globe through the phone. Details of the CellScope and its functions were published in the July 22 online issue of the journal PLoS One. The researchers at the University of California, Berkeley, attached a microscope lens to the phone with 3.2 megapixel resolution camera. "The technology is adaptable to any cell phone camera offering high resolution clear images," said co-lead author of the study David N Breslauer. The prototype using a Nokia N73 model helped diagnose malaria, sickle cells disease and tuberculosis. The device can detect organisms 1.2 micrometres in size (the human red blood cell diametermeasures 7 micrometres). A light emitting diode (led) is used as the light source. "Easy accessibility and precision make the cellscope a potential tool for easy diagnosis," said malaria expert David Sullivan who works at the Johns Hopkins Bloomberg School of Public Health. The device can also help cut down trips to the hospital. Cancer patients, for instance, can use it to determine their blood cell count at home and send the results to an expert. Nirbhay Kumar who works in the centre for molecular and immunology at the Johns Hopkins School said he was not sure if the cellscope could provide effective diagnosis. He said the pictures published in the study of cultured malaria parasites looked reasonably convincing but he was not sure if such images could be obtained from a patient's blood processed in the field. "Patients often have low parasite count which may not be revealed in low magnification examination," said Kumar. He added it was not clear if the device would really offer cheaper solution to existing microscopic examination. Price and availability of the device can be decided only after field tests said Breslauer. Initial field tests were conducted in Bangladesh, Congo and Tanzania. Extensive field tests will begin soon, he said. A P Dwivedi, regional service manager for German-based company Leica that deals in laboratory equipment, said the led is low cost and can be recharged with a small battery. This makes it easy to use in areas where electricity is not available. The CellScope has some technological advantages too. The software used for image analysis is written in java and can be used on any operating system (like Microsoft or Linux), Breslauer said.